Law Society poll did not reveal all – SLCC. 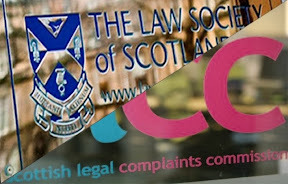 THE FINDINGS of a Law Society of Scotland survey claiming hard-to-verify client-solicitor satisfaction rates have come in for criticism by the Scottish Legal Complaints Commission (SLCC) – the ‘independent’ regulator of solicitors & legal services in Scotland. The Law Society poll – published in early January 2015 - claimed Scottish solicitors were highly regarded by the public. However, the SLCC have now challenged the poll’s findings, claiming high levels of legal service in Scotland are “not a universal experience”. 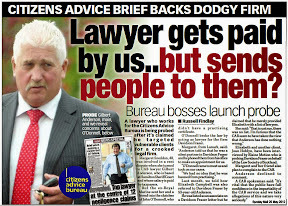 The ‘independent’ SLCC also cited higher compensation awards against rogue solicitors and ‘increasing redress’ provided by the SLCC to wronged clients. And, in another swipe at the Law Society’s poll dodging, the SLCC has now revealed that only a third of clients polled who were dissatisfied with their solicitor did anything about it, and not one client involved in the poll knew they could refer their complaint to the SLCC. However, carefully prepared statements avoided any explanation on why the SLCC’s involvement in the poll was kept secret until a media investigation published documents revealing the SLCC's role. 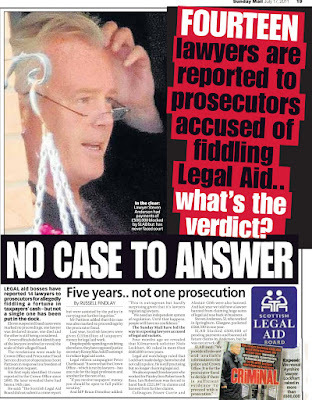 The SLCC went on to explain it’s previously secret involvement in the poll, revealing it asked searching questions on how clients react to the provision of poor legal services. 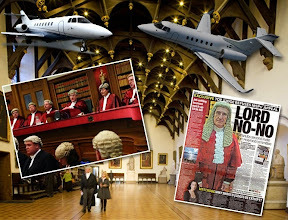 “We were given the opportunity to include questions in the Law Society’s poll. We asked two related questions aimed to assess public awareness of the role of the SLCC. In particular, we wanted to know whether clients who were dissatisfied with the service they had received from their solicitor knew they could bring their concerns to us. The answers to these questions were revealing. Of those who were dissatisfied with their solicitor: only a third did anything about it; and none knew they could refer their complaint to the SLCC. 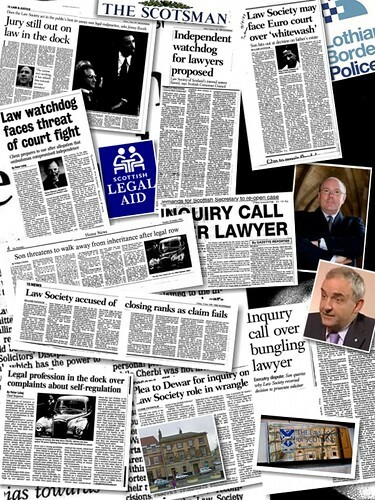 Solicitors throughout Scotland have a duty to make their clients aware of the SLCC and how to make a complaint to us. We continue to see evidence that this is not happening – less than 5% of those who complain to us say that they found out about us from their solicitor. We are concerned that, as a result, the voices of many dissatisfied clients are just not being heard. As a priority, we are currently working with the Law Society to ensure that all solicitors provide clear and consistent sign-posting to our service. 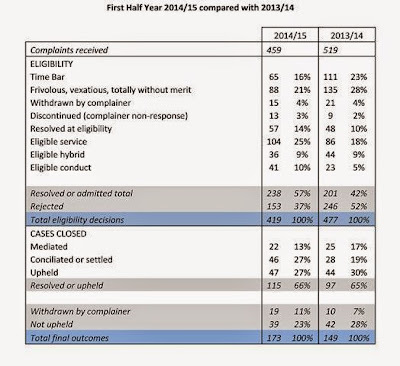 Complaints slightly down – SLCC statistics for first half of 2014/15. 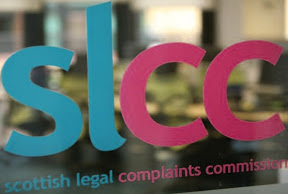 Alongside the SLCC’s attempt to clear the air on their involvement in what some legal insiders have referred to as a “vanity survey”, the SLCC released complaints statistics for the first half of the operational year, showing a slight drop in complaints. The SLCC said: “The headline figures for the first half of the SLCC’s operational year show that, overall, the number of complaints we receive is declining, reflecting a continuing trend which we have highlighted in previous years. More importantly, however, we note the proportion of those complaints which are either accepted as eligible complaints or resolved by us during our eligibility process. They represent almost 60% of all received complaints (up from just over 40% in the corresponding period in 2013). 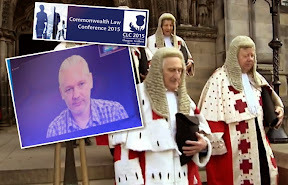 The Law Society did not comment on why the involvement of the SLCC was withheld from statements released by the Law Society along with articles written for newspapers during January by the Law Society’s own President – Alistair Morris. 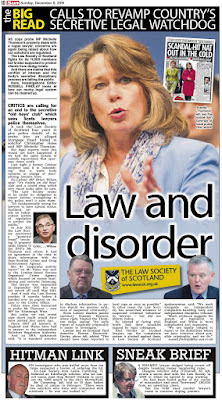 The research carried out by IPSOS MORI for the Law Society of Scotland claimed that of clients who had used a solicitor in the past five years - more than 90% “of respondents” said their own lawyer was either very trustworthy (70%) or fairly trustworthy (27%), with 87% describing solicitors overall as very or fairly trustworthy. However, no detailed material has been made available which could verify the claims, or identify which solicitors or law firms were involved. It has also emerged some solicitors and law firms were provided with scripted responses by the Law Society to answer questions from the pollsters. 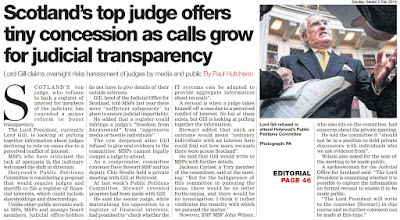 Legal insiders also point out the SLCC’s admission of involvement in the ‘rigged’ poll only came about after the publication of heavily redacted communications between the SLCC & Law Society which revealed both regulators discussed how to frame questions for the survey. The now published documents also revealed the Law Society demanded all material handed to the SLCC regarding the poll was not to be released to the public or media. 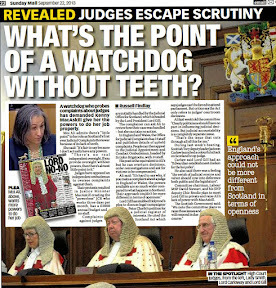 The tough life – being a judge. 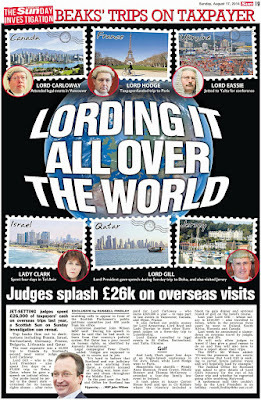 THEY FLY around the world in first class at great public expense on state visits to democracies & middle eastern dictatorships, give lectures on legal ‘ethics’ to willing ears & pockets, wander around Ferrari filled museums and have such vast wealth and connections to big business, crime & tax avoidance - they refuse to declare it. 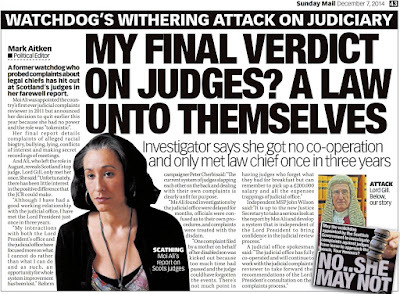 However - according to the Judicial Attitude Survey Scotland 2014, judges feel their working conditions are becoming tougher, and that they are a touch unloved by government, the media and anyone who does not conform to the closed ivory tower world of justice and the courts. 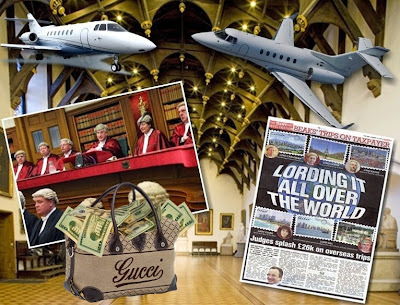 The latest survey of opinions of the highest earning judiciary in the whole European Union – Scottish judges - portray a judiciary more akin to grumpy old men than their closeted, treasured reality of £130K to £220K a year salaries plus expenses, chauffeur driven cars, multi million pound property portfolios & Victorian mansions, million pound pension pots, influence beyond many boardroom directors, racking up air miles like Strategic Air Command, the occasional political meddling and of course, that ultimate judicial power over life, the universe, and well, everything. 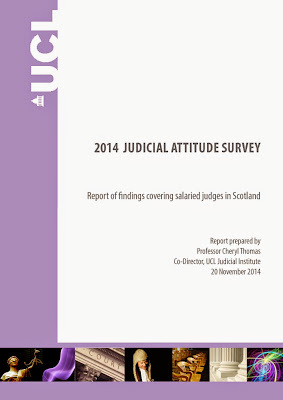 Bitterly complaining about their financial circumstances, the report detailing the views of the judiciary states: It is clear that the key issue for almost all Scottish judges (80%) is the loss of net earnings they have suffered over the last 5 years, and that their pay and pension together do not adequately reflect their work (74%). In addition, over half of all judges (55%) do not feel they are paid a reasonable salary for the work they do. While almost half (43%) said the changes to pension entitlements have affected them, three-quarters of judges (74%) say they accept that some changes to pension entitlements have to be made. Judicial Attitude Survey Scotland 2014 Judges were asked the following: "Given the current economic situation, which of the following approaches to judicial pension entitlements would you accept as fair? "In response, over three-quarters (78%) of Judges felt that the fairest approach would be reductions only for new judges entering the judiciary. All judges were asked to assess the availability of four opportunities in their current judicial post. There was little in the way of opportunities that judges in Scotland rated much more than adequate. The overwhelming majority of judges reported that in their current post the following opportunities were either non-existent or poor: opportunities for flexible working (83%) opportunities to sit in other jurisdictions (81%). A majority also said opportunities for career progression were either non-existent to poor (64%). Morale in court came in for more criticism, as Judges were asked to rate five specific working conditions at their main court or tribunal. 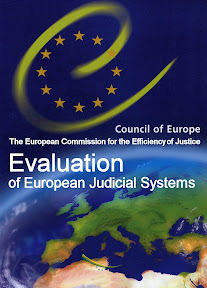 Only the quality of administrative support and facilities for interaction with other judges were rated by a majority of judges as either good or excellent. Morale of court staff was rated lowest, with 74% saying it was either poor (40%) or adequate (34%). 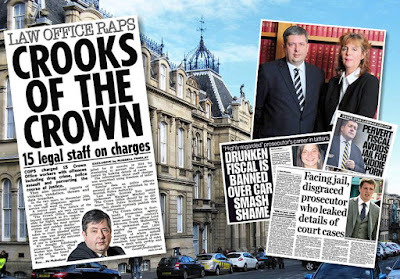 Court resources came in for criticism – even after a recent £60m spend on Parliament house provoking M’luds to vent their disapproval on dodgy IT and internet access - in between air miles, holidays in Qatar and sniping at Holyrood committees. Just over half of all judges in Scotland feel that library and books (53%) and the physical environment at court (51%) are good to excellent. Half (50%) feel IT support is good or excellent, but a third (32%) describe it as adequate or poor. The standard of IT equipment available in court is rated the lowest, with 43% saying it is poor and 38% saying it is adequate. Internet access is rated poor by 22% and adequate by 45%. A majority of judges (55%) rate the standard of personal IT equipment provided to them as adequate. An overwhelming majority of judges who have been in post for at least 5 years (82%) feel that working conditions are worse now than they were 5 years ago. While the Senators are divided in their view about working conditions compared with 5 years ago, almost all Sheriffs (88%) feel that working conditions are either significantly worse (37%) or worse (51%). 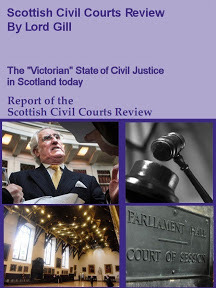 On being a judge, along with all the trappings of judicial office, the survey reports virtually all judges (98%) in Scotland feel they provide an important service to society, with 79% agreeing strongly with this view. While most judges in Scotland have a strong personal attachment to being a member of the judiciary, this is less pronounced amongst Senators in the Inner House (67%) than those in the Outer House (100%) and Sheriffs (93%). Over two thirds (67%) of all Scottish judges say that members of the judiciary are respected by society at large less than they were 10 years ago, with Sheriffs more likely to perceive a decline in respect (70%) than Senators (48%). Judges feel most valued by their judicial colleagues at court (90%), court staff (88%), the legal profession (84%) and parties in cases before them (74%). Half of all Scottish judges (50%) feel valued by the public, but very few (8%) feel valued by the government. Only 10% of the judges who replied to the survey felt they were valued by the Media. Change is not a good thing in the eyes of judges - according to the survey. Responses from the judges made it clear they feel they must control any changes to the judiciary. Judges were asked: What factors do you feel prompt changes that are imposed on the judiciary? Almost all judges (91%) see government policy initiatives as driving change in the judiciary, followed by new legislation (74%) and public misunderstanding of the judiciary (66%). 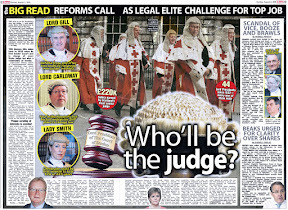 Just over half of all judges (56%) see media representation of judges as driving change. Almost all judges (88%) feel their job has changed since they were appointed in ways that affect them. But while a majority of Sheriffs (52%) said the job had changed a large amount or completely, most Senators (73%) feel it has only been a limited change. Almost all judges (84%) feel the judiciary needs control over changes affecting judges; 72% say some change is needed in the judiciary; and 60% believe too much change has been imposed on the judiciary in recent years. There is no consensus on whether the judiciary manages change well, or whether the amount of change in recent years has brought judges to breaking point. 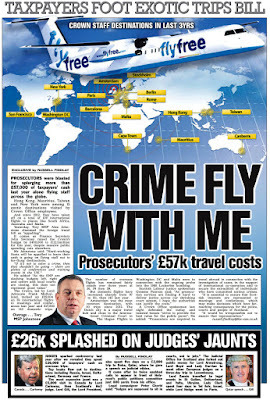 Money - the usual driver in everything from crime to justice features prominently in the minds of the judiciary. Judges said they may consider leaving judicial positions if they do not get their own way on higher salaries. 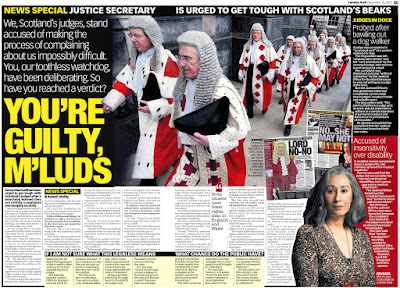 A large proportion of the Scottish judiciary say they might consider leaving the judiciary early over the next 5 years. This is particularly marked for Senators in the Inner House, where almost three-quarters (71%) of judges who will not reach full retirement age in the next 5 years either might consider leaving early (57%) or are currently undecided (14%). There are two main factors Scottish judges say would prompt them to leave the judiciary early: further limits on pay awards (70%) and reductions in pension benefits (70%). A majority (54%) would also be prompted to leave early by an increase in workload. An overwhelming majority (88%) of judges said one key factor would help to keep them in the judiciary until they reach retirement age: higher remuneration. Judges identified the main future challenges for the judiciary as: fiscal constraints (91%), reduction in support staff (84%), litigants in person (80%), attracting the best people to the judiciary (80%), judicial morale (79%) and loss of judicial independence (72%). 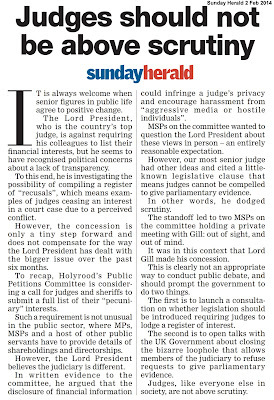 The survey did not contain any mention of proposals before the Scottish Parliament to create a register of judicial interests, as called for in Petition PE1458: Register of Interests for members of Scotland's judiciary. 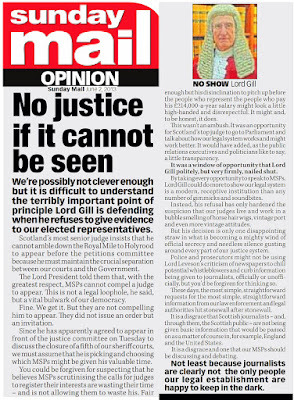 On behalf of Scotland’s entire judiciary, top judge Lord Gill has bitterly resisted any calls to require judges to declare their significant wealth in a public register. 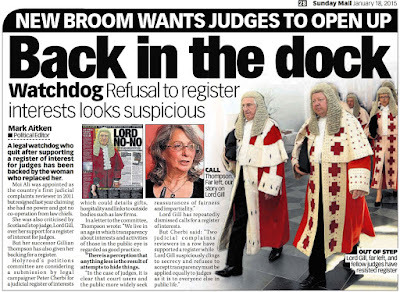 The judge – who refused to give evidence at the Scottish Parliament over the matter has also resisted calls to make the judiciary more transparent and accountable, even freezing out independent oversight of complaints about judges. 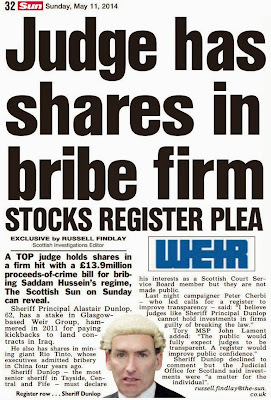 The proposals to create a register of judicial interests - submitted to the Scottish Parliament’s Public Petitions Committee in late 2012 envisages the creation of a single independently regulated register of interests containing information on judges backgrounds, their personal wealth, undeclared earnings, business & family connections inside & outside of the legal profession, offshore investments, hospitality, details on recusals and other information routinely lodged in registers of interest across all walks of public life in the UK and around the world. 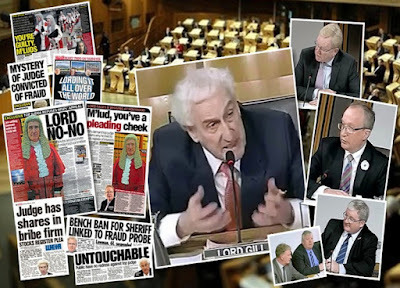 Since January 2013, members of the Petitions Committee have looked at the issues raised in the petition, and took evidence from Scotland’s first Judicial Complaints Reviewer (JCR) Moi Ali - who supports the petition. 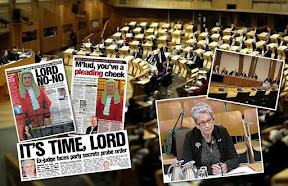 During evidence at the Scottish Parliament’s Petitions Committee last September, Moi Ali told msps there was little transparency or accountability in Scotland’s judiciary. Law Society poll details to remain secret says regulator. 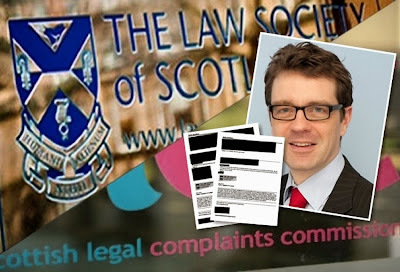 A SURVEY conducted by the Law Society of Scotland claiming Scottish solicitors are highly regarded by the public was so dishonest, the involvement of the ‘independent’ Scottish Legal Complaints Commission (SLCC) and discussions about the poll and question rigging had to be censored out of documents released under Freedom of Information legislation. 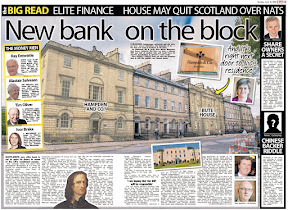 AND, it emerged from an investigation into the poll the Law Society of Scotland demanded that all key documentation shared with the SLCC was provided to them on a confidential basis and on condition the material was safe from searching Freedom of Information enquiries by the media. The survey went onto claim high numbers of clients felt their solicitor was an expert in their area of law and had provided good service enough to recommend to others. However, no independent material has been made available which could verify the claims, or identify which solicitors or law firms were involved. 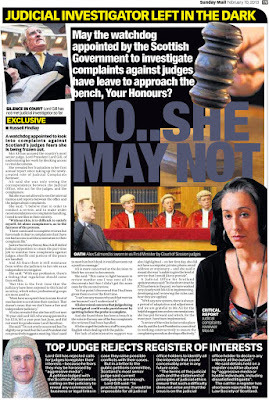 Today, in documents released by the SLCC - blacked out to conceal discussions with the Law Society on how to ‘frame’ questions for the Ipsos-Mori survey, a murky trail of data manipulation emerges between the ‘independent’ SLCC & the Law Society – involved in a concerted attempt to manipulate the public into believing client-solicitor satisfaction rates are higher than the eventual publicity about the poll – published in late December 2014 & January 2015. The documents released by the Scottish Legal Complaints Commission reveal a series of polls, carried out by the Law Society in order to boost its image and that of the legal profession. In one email between the SLCC and Law Society representatives on the ‘poll’, a Law Society representative tells his SLCC colleague: At the recent LSS/SLCC strategy day, I agreed to provide you with our polling plans so we could discuss possible areas for some joint work. There are three pieces of polling work which we plan to carry out before the end of the calendar year, all carried out by Ipsos MORI. • Public polling on attitudes towards solicitors (around 1,000 people) - polling carried out in September with results due in October. • Political monitor (around 100 Members of the Scottish Parliament) - polling carried out Sep-Nov with results due in early December. • Members polling (around 550 members) - polling carried out in December with results due by calendar year end. Can I suggest that we find some time in the next few weeks for us to chat through the questions we have asked in the past and plan to ask this year? Perhaps Wednesday 13 or Thursday 14 August? After a round of fixing questions and manipulation of data, an email from the Law Society of Scotland complains Ipsos cannot get to work on the survey because the pollster company was “busy with referendum stuff” in reference to the Scottish independence Referendum during September 2014. 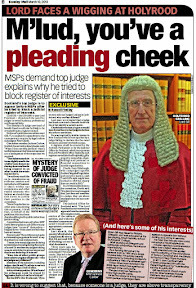 During attempts to publicise Ipsos-Mori survey, the Law Society had so much difficulty obtaining publicity it’s own President – Alistair Morris put his name to articles spinning out the poll – which now appears more of a spin session than an accurate accounting of what the public really feel about high charging Scots lawyers who are costing their own legal profession over £1000 a day in compensation awards to ripped off clients. 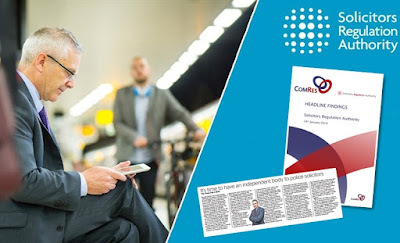 Outgoing SLCC Chief Executive Matthew Vickers backed the decision to keep much of the details of the SLCC’s involvement with the survey a secret. He also supported the Law Society’s condition of providing documentation to the SLCC on the sly. 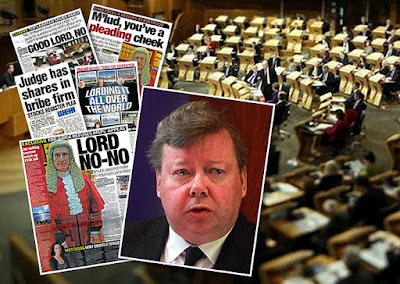 Matthew Vickers said: “The information which has been withheld relates to the survey carried out on behalf of the Law Society of Scotland ("the Society") by IPSOS MORI. The SLCC was given the opportunity by the Society to contribute some questions to the survey and following the survey the results of the poll were shared with the SLCC by the Society. The Society provided the material to the SLCC on a confidential basis and this was agreed and reaffirmed with the society at the time. 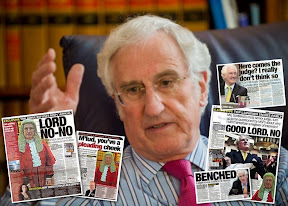 Vickers – who is standing down from the SLCC to take up a role in mediation at Ombudsman Services, added he strongly rejected any calls for the Law Society documents to be released in the public interest. Vickers said there was a greater interest in withholding the information from the public than releasing it. However, it now transpires a number of solicitors did not want anything to do with the survey, some even questioning it’s cost and worth. Earlier today, a law firm contacted in the survey talked about the discredited poll, admitting they were provided with a scripted response on how to respond to the pollsters. 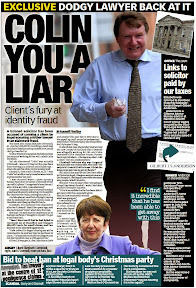 Speaking to DOI a solicitor claimed he disagreed with the Law Society intruding into solicitor client relationships purely to seek publicity for it’s own ends. 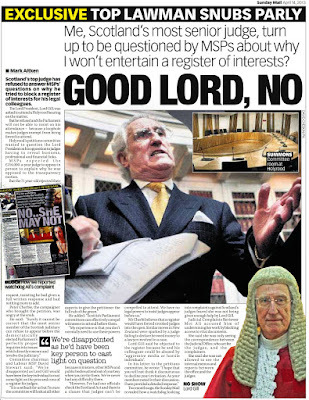 He said: “The Law Society’s desire for publicity is more often than not counter productive and creates an unnecessary air of potential disagreement or conflict if clients refuse to become involved”. The solicitor indicated colleagues in the profession had also received similar prompts from the Law Society to respond to the “vanity survey”. Court media guide faces dishonesty claims. 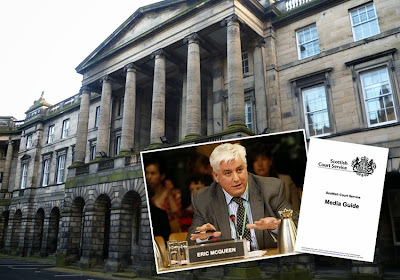 DOCUMENTS giving advice on how the courts should handle media enquiries reveal staff at the Scottish Court Service (SCS) are told to provide a scripted response of false information when faced with certain questions from journalists. 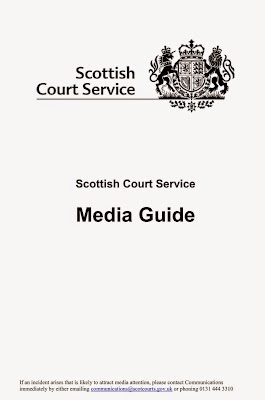 The Scottish Court Service media guide - obtained in response to a Freedom of Information request, was initially released in a redacted format - deliberately concealing the sections of the guide which recommend court staff lie to the press when asked about convictions. 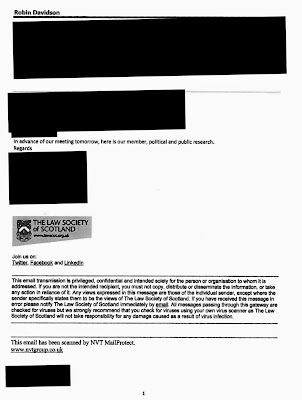 However, after the Scottish Information Commissioner became involved in the matter, the guide was grudgingly released by the SCS in an unredacted format - revealing the controversial written advice to SCS staff on how they should conceal types of information when queried by journalists. In one section detailing how SCS employees should reply to enquiries relating to spent convictions, Page 18 of the redacted version of the SCS media guide states “If a conviction is spent it should be treated as though it never existed.” with the remaining details concealed. 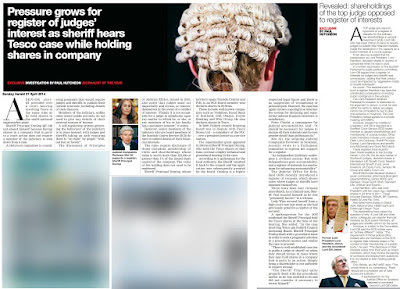 Private Proceedings also came in for censored advice after it emerged the Court Service had deliberately concealed references on page 14 of the redacted version of the SCS media guide to judges holding proceedings in private - merely as a convenience, and to avoid a hearing in open court – which may end up in the press. The media guide also bans any “fishing enquiries”. 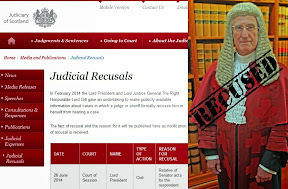 Court staff are told to deal only with requests about specific cases. 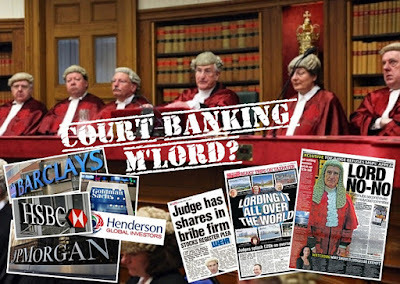 Courts to serve fracking & energy interests - top judge. 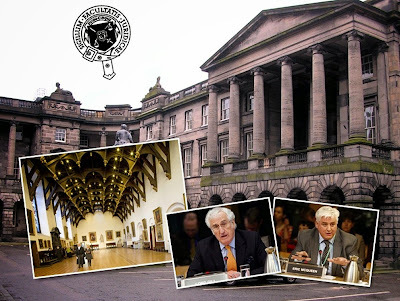 SCOTLAND'S top judge, Lord President Lord Brian Gill has spoken of his hopes that fracking for shale gas will increase business in the courts. 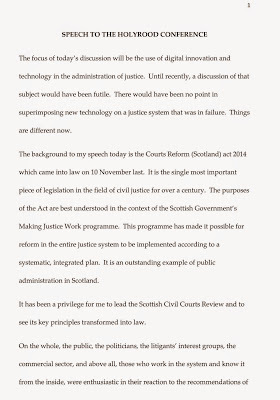 The top judge also wants to turn Scotland's legal system into a mediation haven for big business, big oil, shale gas barons & bankers, according to a speech he gave on the theme of “Digital Justice” last week. The move is hoped to draw in millions for lawyers and judges - without the need to declare any interests. 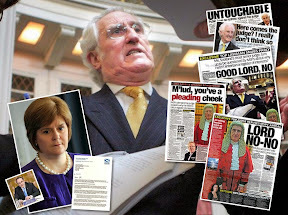 During the fourteen page speech – Gill (72) also urged the legal sector to better exploit Scotland’s “natural resources” and renewable energy for their own profit. However, Gill’s own views on the nation’s energy policy and how the legal sector should exploit it for their own ends was delivered the very same day the Scottish Government grudgingly announced a ban on new shale gas fracking schemes. Making a statement announcing the ban on fracking after it emerged Energy Minister Fergus Ewing had criticised MSP Joan McAlpine for assisting constituents against plans by the Duke of Buccleuch to mine coalbed methane at Canonbie in Dumfries and Galloway, Mr Ewing told the Parliament: "I want to ensure that the voices of the communities likely to be most affected are heard, and are heard in a more formal and structured way.I am therefore announcing today that in addition to the technical work I've referred to on planning, environmental regulation and upon assessing the impact on public health, Scottish ministers will also launch a full public consultation on unconventional oil and gas extraction." In spite of the Minister’s promises of a full public consultation, it has been reported there are many in Canonbie who are “too afraid to speak out” against fracking - and now, with the courts and judiciary seemingly keen to exploit fracking and other runs on natural resources “to follow” as a profit model - it can surely only be a matter of time before wealthy landowners turn to their friends and investors in the courts to ensure shale gas plans go ahead - no matter the views of local communities and residents. 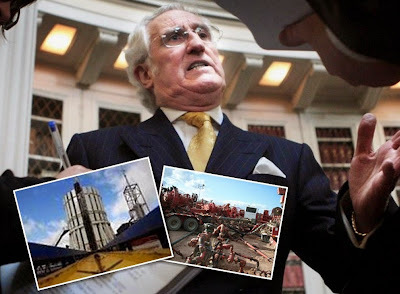 Speech by Lord Gill on Digital Justice, Fracking & Big Oil. 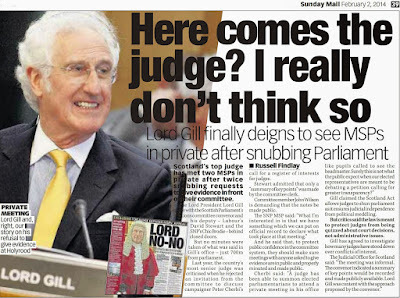 During the speech, Lord Gill also chastised his own judicial colleagues & lawyers for missing out on exploitation of Scotland’s oil boom. 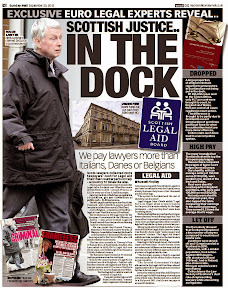 The top judge also claimed Scotland can be made an international centre for litigation and mediation. 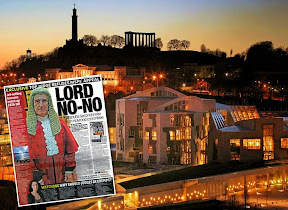 However, Gill's policy of promoting the murky, expensive and disreputable Edinburgh legal world as a centre of international litigation and mediation may well be destined to hit the buffers. 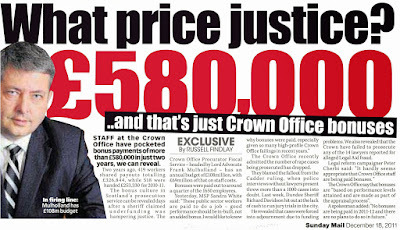 Previous attempts by the Scottish Government and now former Justice Secretary Kenny MacAskill to bring make Scotland a more attractive place for international litigation and mediation have come to nothing, even after large amounts of public money have been thrown at the idea and public money lavished by Scottish Ministers on enterprises such as the Scottish Arbitration Centre. 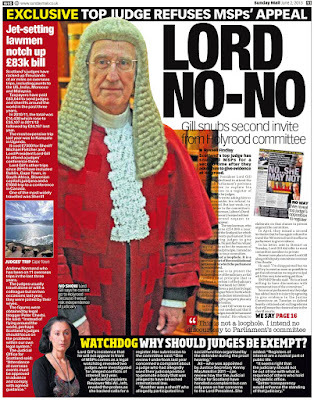 And, despite Lord Gill’s claim of judges supporting the economy, it is unclear how much the judiciary is financially contributing to Scotland, given judges refuse to declare their financial interests. 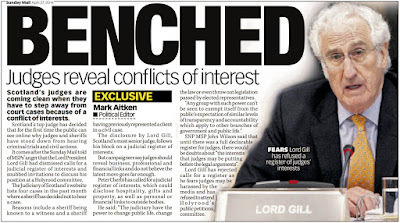 Over the past two years, Lord Gill has fought a bitter battle with the Scottish Parliament who are considering a proposal called for in Petition PE1458: Register of Interests for members of Scotland's judiciary to creating a register of interests for judges. 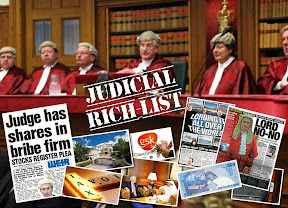 The move to bring transparency to judges wealth, links to business & other interests comes after it emerged members of the judiciary have a significant proportion of their undeclared riches in offshore tax havens, arms length trusts, shareholdings in vested interests, energy firms, land ownership, companies linked to public contracts - some within the justice system itself, companies involved in organised crime and secretive links to big business, finance & banking. Matthew Vickers, CEO of law regulator resigns for mediation post. 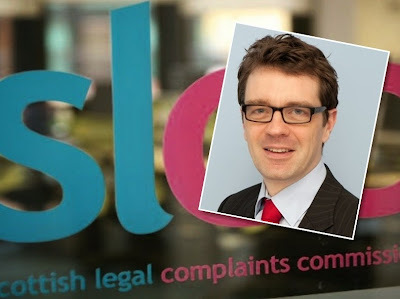 TROUBLED regulator of solicitors - the Scottish Legal Complaints Commission (SLCC) has announced the resignation of yet another Chief Executive - Matthew Vickers - who steps down in March 2015 for a post in the world of big business mediation. 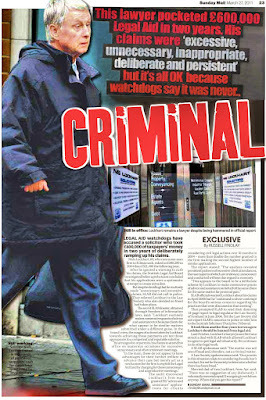 Mr Vickers, who took on the CEO role at the SLCC during summer of 2012 after the ‘independent’ regulator had lost several bosses over a four year span - is leaving to take up the post of Deputy Chief Ombudsman at Ombudsman Services - a not-for-profit organisation which provides independent dispute resolution for the communication, energy and property sectors. Commenting on the resignation SLCC chair, Bill Brackenridge said: “We are grateful to Matt for his leadership and contribution since he joined the SLCC as CEO in June 2012. He and the management and staff have worked hard to make the SLCC a more efficient, effective and influential organisation. We are now well established as an independent and impartial body. Of course, we recognise that there is a great deal of work to be done and we have started our search to find a CEO who will help us to tackle it." 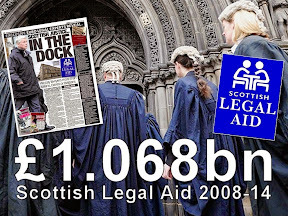 The overly pro-lawyer, anti-consumer SLCC – frequently accused of bias towards solicitors over poor handling client complaints has cost clients a staggering £18 million since it was created in 2008 with an extra £2million of taxpayers money handed over by the Scottish Government. The cost of running the SLCC is met by a complaints levy of around £300 a year, paid by solicitors who then go on to recover the levy through hikes in legal fees to clients. 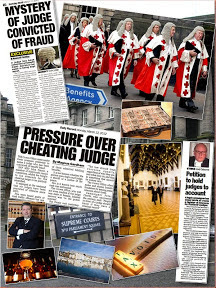 In the eight years since the SLCC has existed, not one rogue solicitor or law firm has been named & shamed by the poorly constituted regulator – once touted as the key to cleaning up the poor and often corrupt reputation of legal services in Scotland. 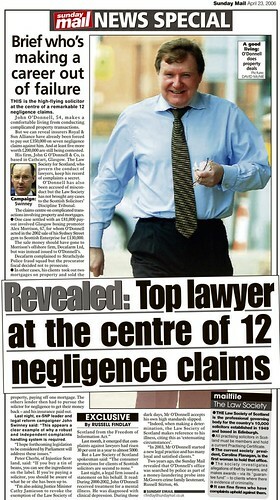 Over the years, the regulator has been subject to numerous scandals, ranging from board members drunken jibes against victims of rogue lawyers, to accusations it failed to use powers to monitor damages claims made in the courts by financially ruined clients against the Law Society’s Master Insurance Policy. 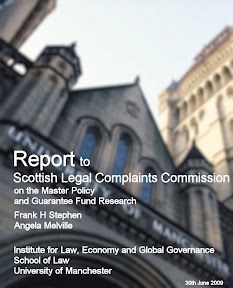 The SLCC’s latest annual report for 2013-2014 claimed the regulator had awarded a record £365K in compensation to clients who filed complaints about rogue Scots lawyers. 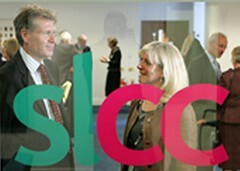 However an analysis of the figures revealed the SLCC only used its powers to nullify fees to clients on two occasions in the past year, raising questions as to why the Scottish Legal Complaints Commission continues to solicitors found guilty of providing poor legal services to demand fees from clients even after ruining their legal interests.